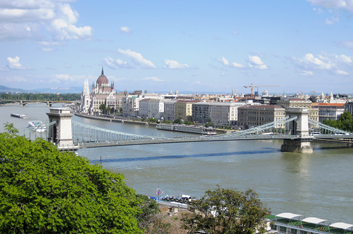 What to do in Budapest if you visit the city for a New Year holiday? 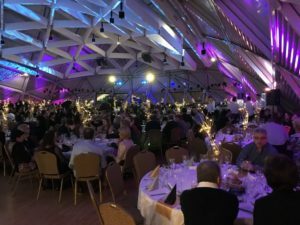 Luckily, there are lots of things to do and to choose from as Budapest is definitely one of the best cities to celebrate New Year offering a wide range of parties for the New Year’s Eve and great options to recuperate on the New Year’s Day. 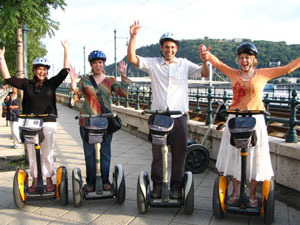 The citizens of Budapest pour out on the streets, which come alive with thousands of people from all over the world seeking fun. The city centre is lively with colourful fireworks, and casual street parties before the final countdown to midnight. No matter what kind of NYE celebration you prefer, you will find the perfect one! If you plan to spend the New Year in Budapest, you will not be bored. 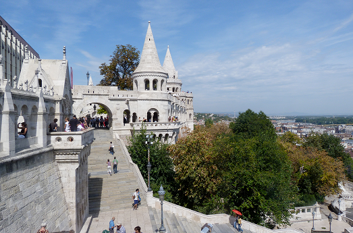 Plenty of programs to choose from and spending quality time with Hungarians who are very good at partying. As both locals and tourists start preparing for New Year’s Eve several weeks before, be aware: in some of the most popular places you have to book your New Year’s program months before its actual date. 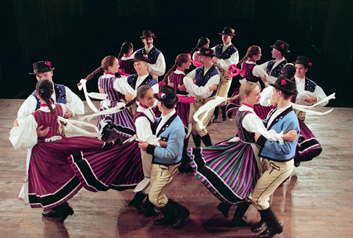 Operas, classical music, ballet, folk music with a lavish gala dinner on the NYE Gala Concert and Show. 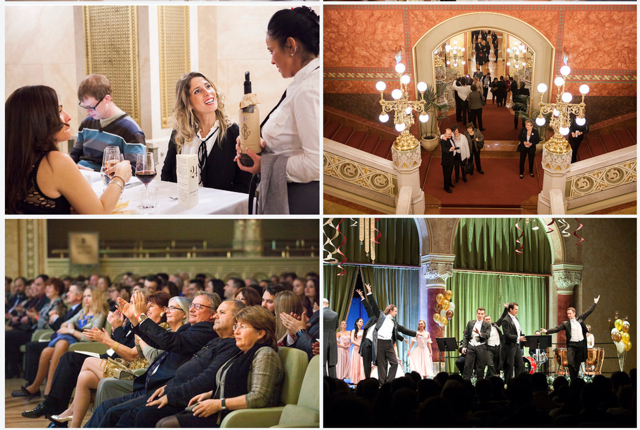 5 course served Gala Dinner in the beautiful Danube Palace Budapest, with a gala concert and an after midnight party. Tickets for a NYE party that brings in 2019 with style, glamour, swing music and delicious buffet dinner on the Swing, Jazz, Funk NYE Party & Concert in Budapest Whale 2019 will sell out very soon, so you had better hurry up buying yours! To get the club feeling with thousands of other young folks, book a ticket for one of the biggest clubs in Budapest, Liget Club at a much cheaper price than most elegant dinner parties. Be spontaneous and you may miss the entry. Tickets purchased earlier are generally cheaper and you may get a table of your own. Celebrate the end of the year in 2019 on the river Danube taking in the unique atmosphere of Budapest on a Budapest NYE cruise. 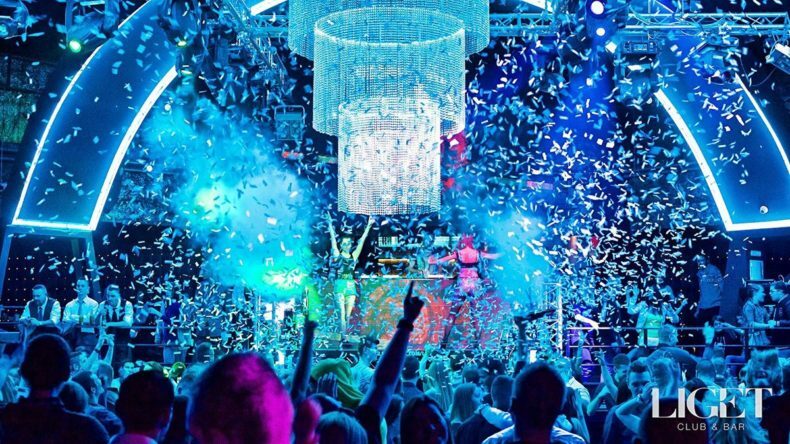 Welcome the New Year with an evening of great foods, drinks, shows, music, and atmosphere. There are all kinds of live entertainment aboard – programs on NYE cruises: retro disco party, a la carte dinners with live shows (folk, Gypsy, or piano), booze cruises (student or uptown style), programs for all generations, younger or more mature visitors will find some great cruises for New Year’s Eve. The programs run full house, so to avoid disappointment, early booking is highly suggested. The options are abundant, but tickets still typically sell out fast. Pick your preference and buy your party cruise entry in advance to get a cheaper early bird price. 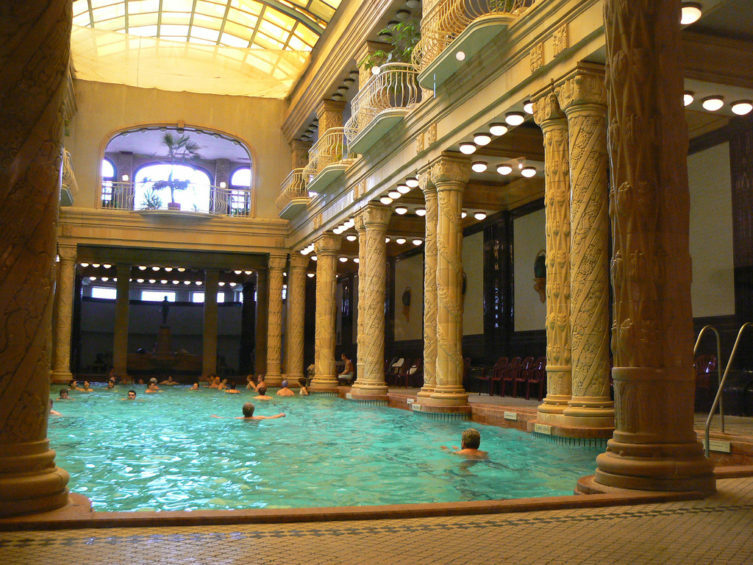 Budapest Baths are one of the main reasons why hundreds of thousands of tourists visit Budapest, all the more in the winter season to warm up for a NYE Party or to relax after a whole night of clubbing on Dec 31. 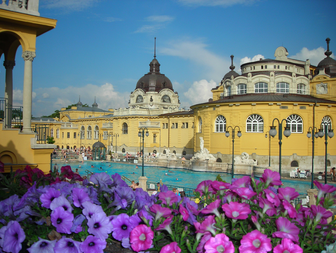 Szechenyi Spa Baths, in a beautiful, richly decorated palace await you in the famous City Park with its 18 pools, steam rooms, saunas and the best massage therapists. Pampering yourself with a massage treatment and experience Europe’s largest thermal spa is almost a must on the last days of the old year. 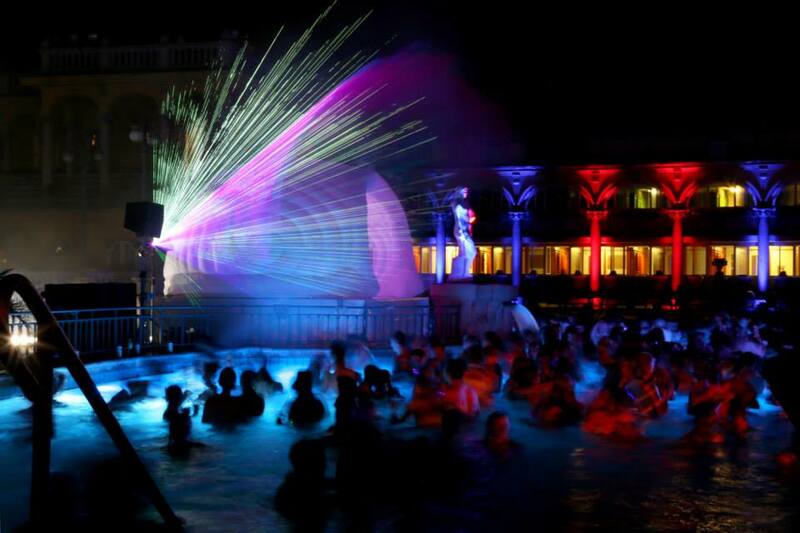 And if you feel fresh enough, take part in the unbelievably unique pre New Year’s Eve pool party on 30 December. Gellert Spa, the other internationally acclaimed spa, is famous not only for its warm spring water pools, but also its architecture, and neighbouring landscape. A great option for January 1st to relax in the thermal waters in Budapest, and to cure your aching dancing legs after the NYE Party. The festive Budapest Christmas markets end during the first week of the New Year so you can still get a chance to browse among the Hungarian artisan crafts. 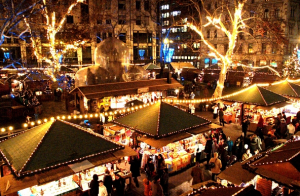 The two famous Christmas Markets are a real treat for people wishing to enjoy Hungarian folk art, buying hand craft products or warming up with a good mug of mulled wine or tea. The oldest, most well-known Budapest Christmas fair is the Christmas Market on Vorosmarty Square in the heart of the capital, while the Christmas market on St Stephen’s Square is in front of the magnificent St Stephen’s Basilica, one of the biggest churches in Hungary.